my spirit exults in God my savior! and people forever will call me blessed. to those who live in his presence. and scattered the proud with their plans. and lifted up those who are downtrodden. Abraham and his descendants forever. Mary remained with Elizabeth about three months and then returned home. 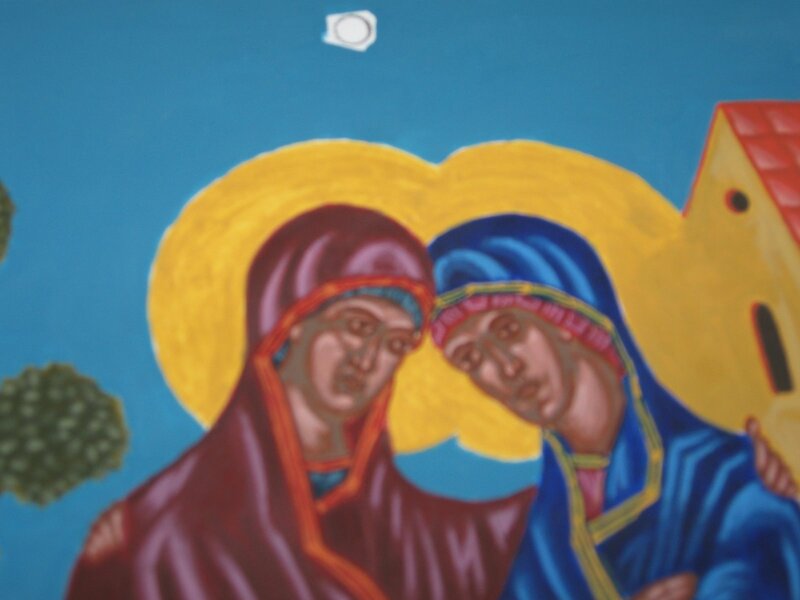 In iconography the three “stars” around Mary represent her perpetual virginity. Mary was a virgin before, during and after her pregnancy. It is a great mystery and witness to contemplate. True beauty is witnessed to by the presence of joy, which false beauty can never summon. True beauty fulfills the heart and remains after the flash and glitz of false beauty has faded. True beauty is often simple and quiet and ordinary. It is a source of life. Iconography teaches us the language of true beauty and it helps to renew our vision – our ability to once again see and recognize beauty that fulfills the soul. Iconography is a gift from the East given exactly when we need it. Iconography – I am convinced – can help heal a soul emptied by false beauty … if one is willing to learn its language. Words spoken by Elizabeth to Mary. Words that were all the more meaningful because they were spoken by someone who herself was living what she said. 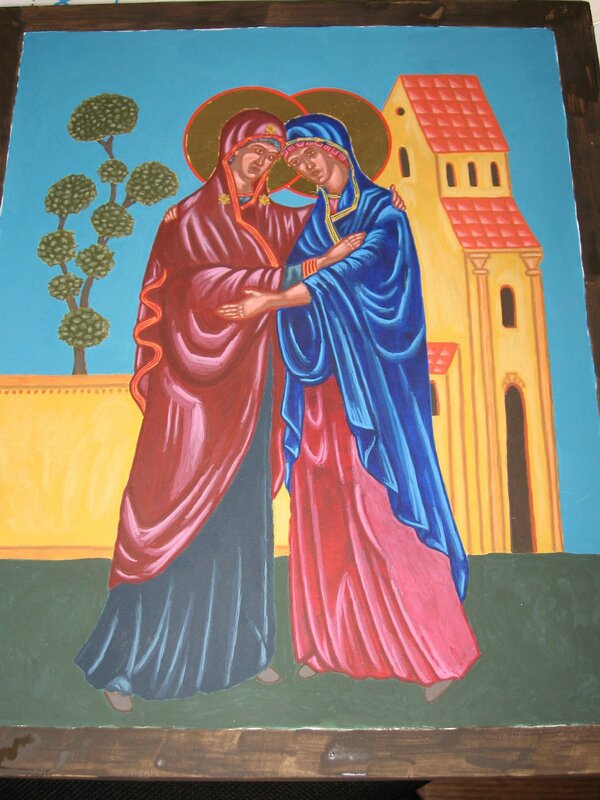 Through the process of writing this icon of the Visitation I have gained a different appreciation of this woman Elizabeth. Before, Elizabeth was just another name in the nativity story for me – a minor character in the background. Really though no one is ever minor in Scripture and when we focus our attention on these “minor characters” we quickly learn that they have some amazing truths to share. Elizabeth has shared some of her truths and has become a woman of deep and strong faith for me, unique in her interaction with the mother of our Lord. I wonder if this might be the real driving force behind the young Mary making the journey to visit her cousin. Certainly we can allow Mary that very human predilection of maintaining a variety of motives – conscious and unconscious. Maybe just as much as going to help her cousin in her pregnancy, Mary made the journey in order to be supported by her older cousin. 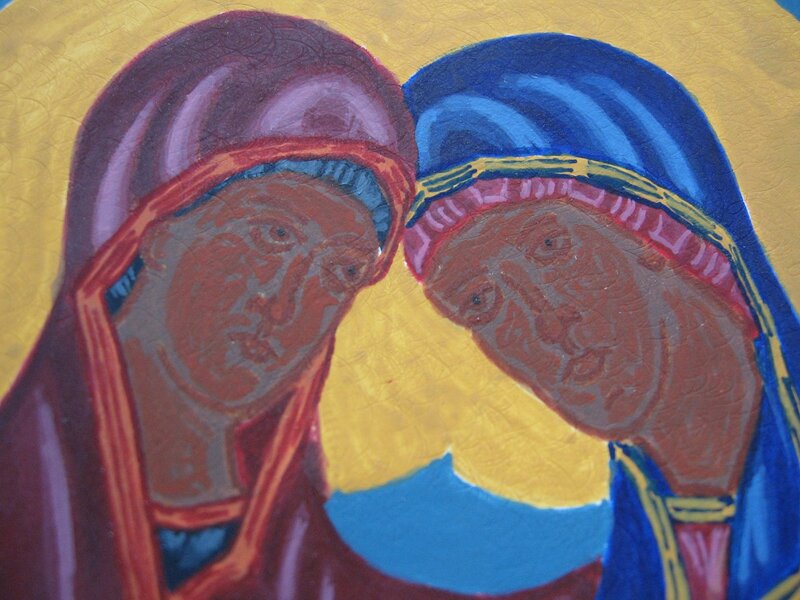 I do not think that it is implausible to hold that Mary needed the wisdom, the practical faith, patience and encouragement that Elizabeth alone had to offer. Maybe in those three months Elizabeth helped to answer some of the questions remaining in Mary’s heart just as much as Mary helped Elizabeth in the remaining months of her pregnancy. 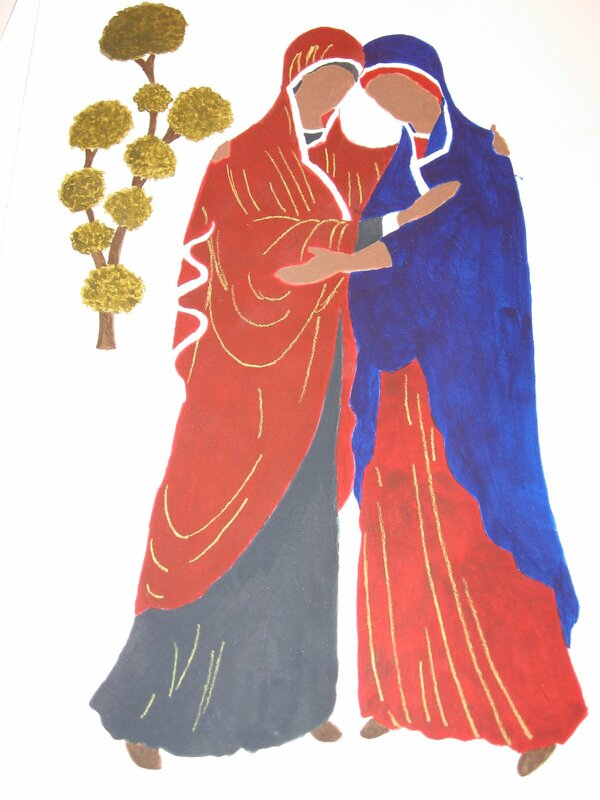 The two women needed one another. It is something to think about – the young Mary needing the help of another. Very often in our imagery Mary is the mother alone with her divine son or the mother giving aid to us wandering pilgrims. 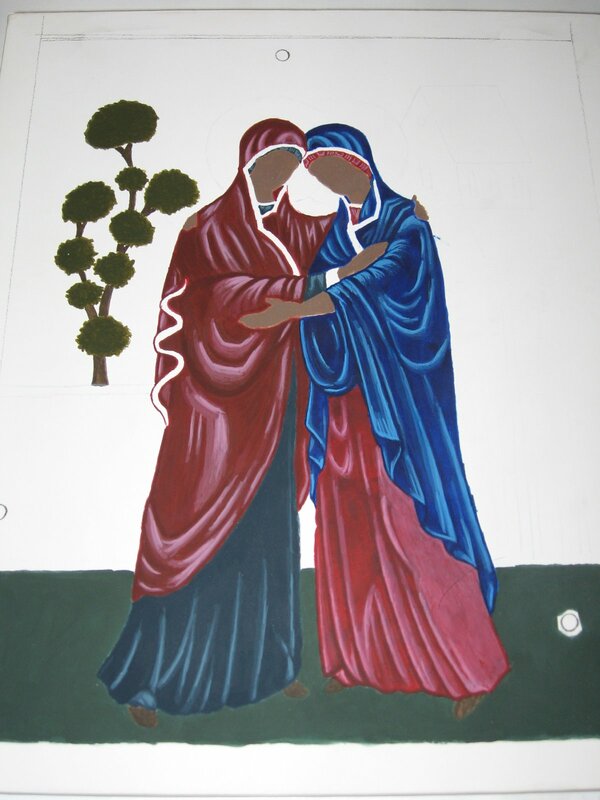 But here Mary is the one receiving comfort and encouragement from another. It is very touching and tender. It is very human. The moment is graced. 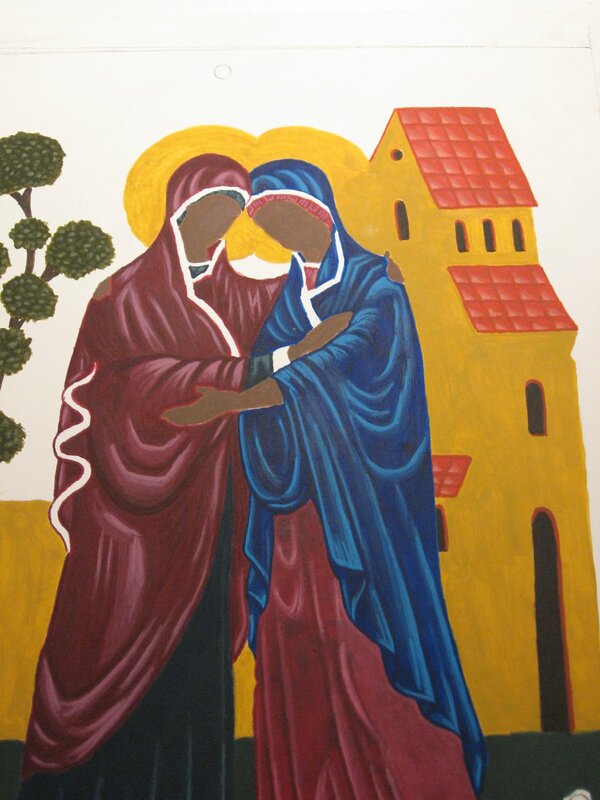 Luke tells us that immediately after hearing Mary’s greeting, Elizabeth, filled with holy spirit, correctly interprets the movement of joy of the child in her own womb and asks, “How is it that the mother of my Lord comes to me?” (Lk. 1:43) Here in this one short verse is found a rich testament to the insight of faith. Elizabeth gives witness to the lordship of Mary’s child before Mary even has a chance to say a word regarding her own pregnancy. The insight is both unmerited and prepared for. God does not force our wills but this does not mean that God will not cooperate with and grant insight and understanding to a will that is well-disposed. Elizabeth is a person of faith. She is someone who has chosen to orient her life toward the fixed point of God. Through a lifetime of habit and choices Elizabeth has disposed her will toward God’s revelation. She is prepared to receive when the moment arrives and it arrives with Mary’s greeting. God will give insight and awareness that the world cannot afford if one is well-disposed and willing to receive. Elizabeth is a witness to the wisdom of the heart that prays. The icon speaks of the possibility of peace but it also instructs that true peace can only be achieved in the willingness to encounter the other. We need to move beyond the walls of fear that we construct in order to meet the other in friendship and in welcome. 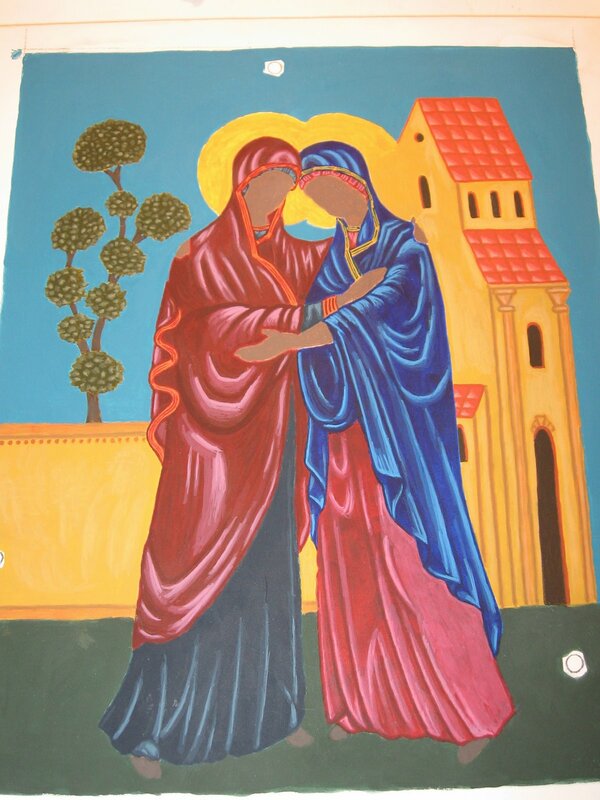 It is telling that the place of encounter between Mary and Elizabeth in this icon is outside the walls (this will become more apparent as the icon develops). Before we can build peace in our world, we must welcome peace into our own hearts, each and every one of us. Yes, there are walls in our world that separate but there are just as many walls within our own hearts and these also are tall and strong. The work of peace begins within. One name we give the Messiah (whom we await in Advent) is “Prince of Peace”. He can help us remove the walls but only if we welcome him, only if we let him in. 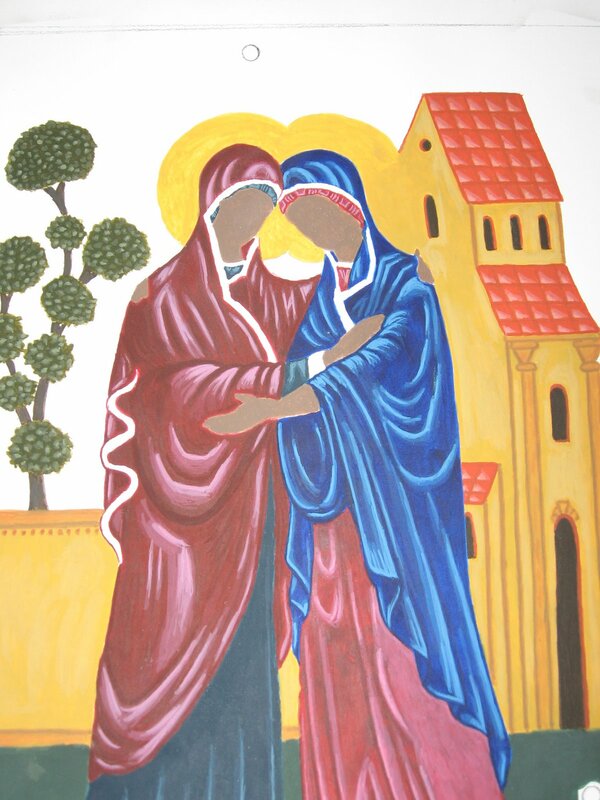 Elizabeth’s loving embrace and welcome of Mary and her child instructs us in the way of peace. I have altered the icon from the original, not intentionally though. 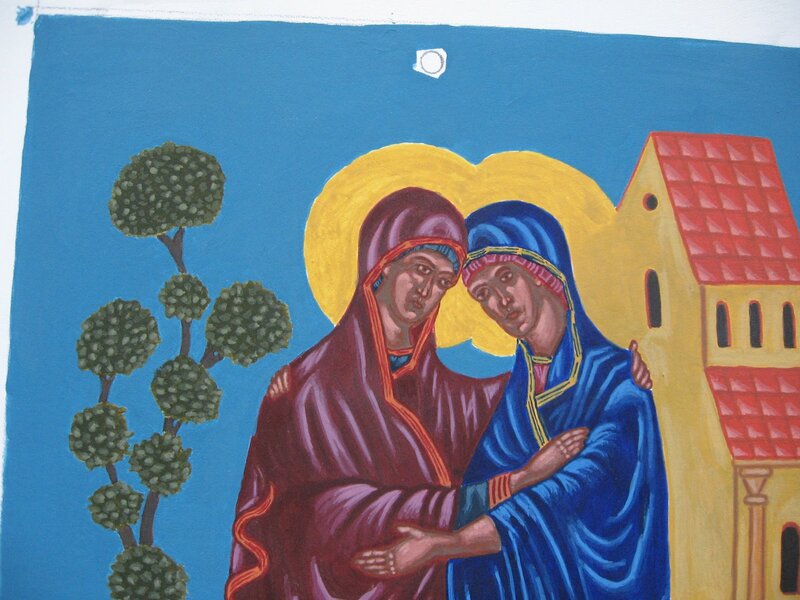 In the original icon – on Elizabeth’s left arm that embraces Mary there is a red sleeve. I did not notice this in the original image I copied from and left the sleeve out. Now Elizabeth’s arm is bare – the sleeve pushed up. I like this though. We “roll up” our sleeves when we are busy, when we have work to do. I can imagine Elizabeth busy about the work of the day when Mary arrives. Immediately this work is left behind as Elizabeth embraces her cousin in welcome! Both of these women knew full well the daily realities of life. Both lived in a setting that our society would classify as “third world” and thus consider of little importance and find easy to ignore. But God does not think as we think and neither does God assign value as we do. 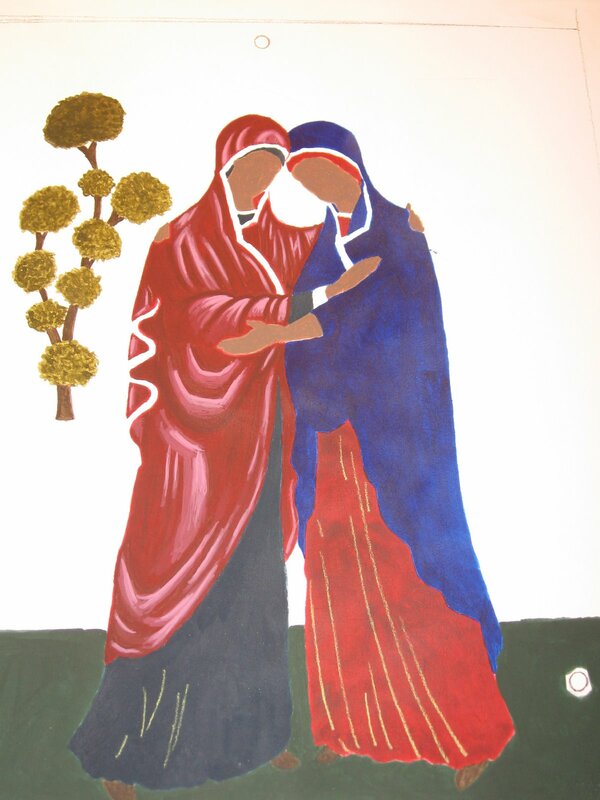 For God, this encounter between two poor women in a third world country is of supreme value. Here is a prayer experiment to help put the image in the context of our day. In prayer, imagine the setting not being what is found in the icon but the scene of a refugee settlement camp in one of the countries of Africa. 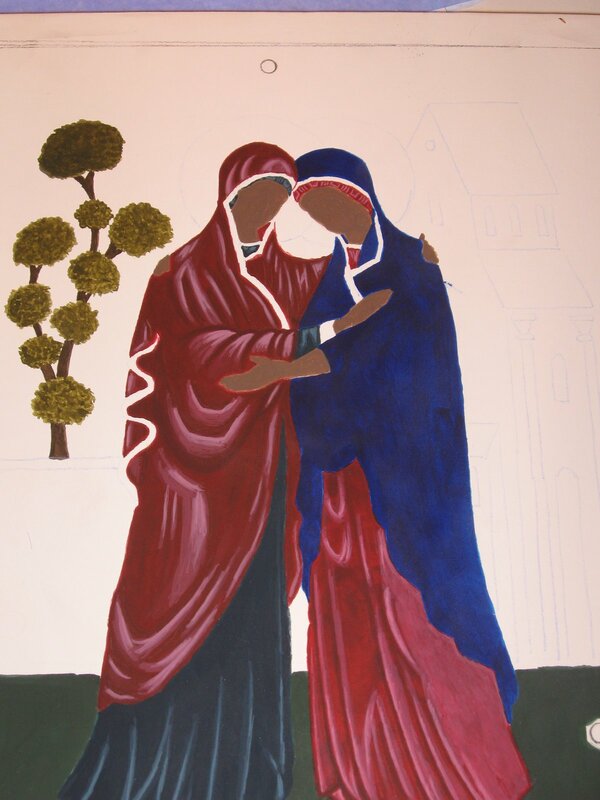 Both Mary and Elizabeth’s skin is of a darker hue and they are members of a tribe forced to flee their country due to the threat of genocide. For weeks they have been separated from one another and finally (after searching non-stop) they find one another in the chaos of the camp. Imagine the joy and the love and the peace of that moment even as chaos and despair seem to swirl around them. This encounter, for God, is of utmost importance; no matter if the world deems it of any significant value. Part of the task put before us during the Advent season is to learn to see as God sees and to learn to value as God values. Behind Mary stands a tree. I do not think that this tree is just for decoration nor is it there just to fill up space and balance the icon. The tree witnesses to the genealogy of Jesus – a genealogy which Matthew in the first chapter of his gospel takes great pains to lay out and to present. Jesus is both son of David (in the particularity of God’s covenant with Israel) and son of Abraham (in the universality of God’s Kingdom). Because of this “both”, the life of the Christian is a life lived in the dynamic tension between both the particular and the universal dimensions of God’s Kingdom. What is also of importance to note in Matthew’s tracing of Jesus’ family tree is how intimately God is involved from the beginning. Throughout the centuries, God both nourishes and prunes this tree and in either circumstance God is there, God is involved. Before demanding obedience to His will, before the dynamic interplay of faith and reason – God seeks relationship with us. This seems to be the primary move on God’s part. God enters into human history. God does not seem to be content to be just creator at the beginning and judge at the end. God enters into the very scene itself and, again and again, plays a dynamic role. This is true in the history of our world and in the history of our lives. God moves in our lives – often in ways unseen and unnoticed but true nonetheless – both nourishing and pruning. 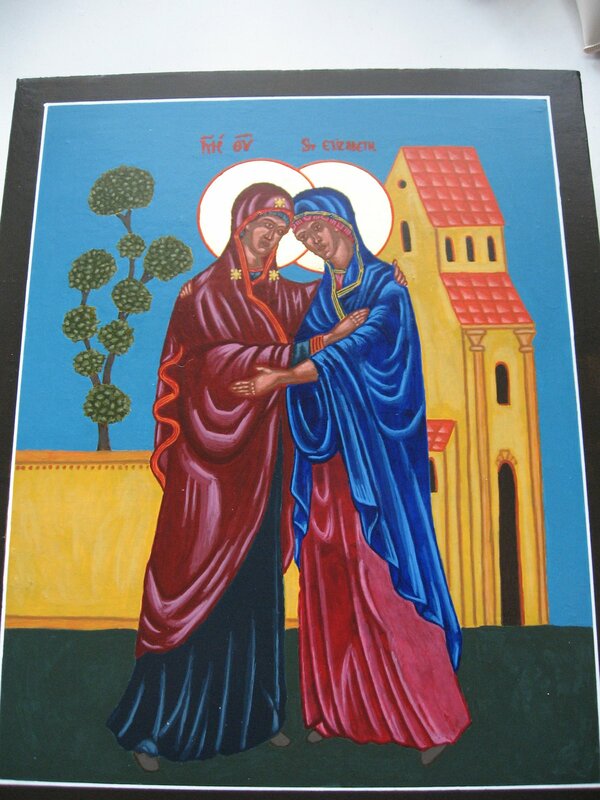 The icon reminds us that God prepares the tree for its fullest flowering – the very Word made flesh. from his roots a branch will grow and bear fruit. 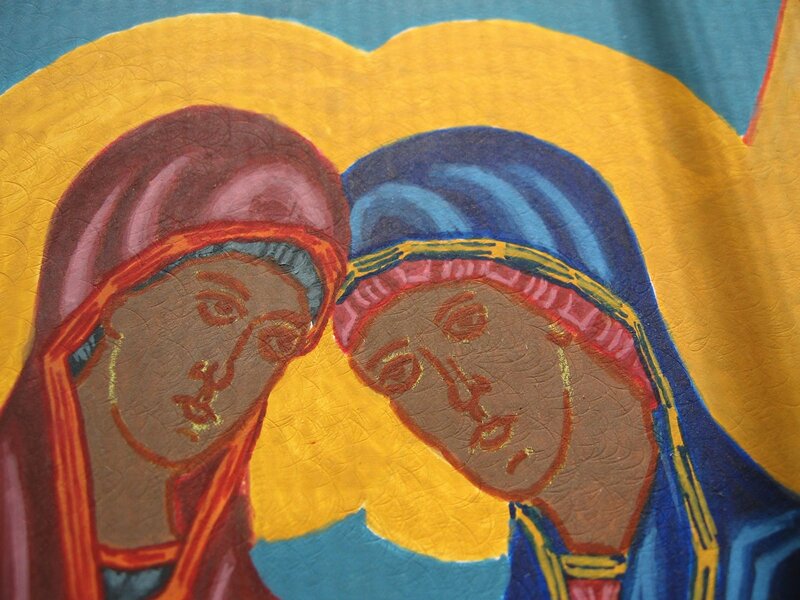 The first step in applying the colors for an icon is to paint the darker, base colors. From this base you then “build up” – adding lighter shades in order to bring depth and movement to the image. 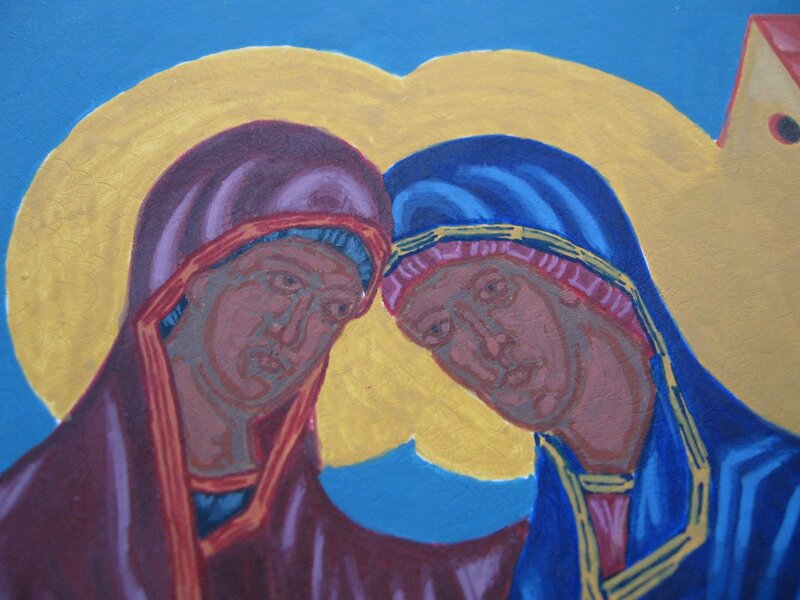 It is a valid art technique and, for iconography, it lends itself to a spiritual/theological interpretation. The interpretation being that the very life of the Christian is a life of being transformed from darkness to light or from glory to glory. In Western Christianity we have tended to primarily emphasize the atoning and redemptive aspect of our faith (Christ took on the weight of our sin thereby setting us free) often to the diminishment of the transfigurative aspect of the Christian life – an aspect that Eastern Christianity has maintained in its thought. Through Christ (which means living the Christian life; i.e. receiving the sacraments, loving God and neighbor, worshiping God, living community, serving others, etc.) we are transfigured. We are changed from glory to glory. It could be said that living these aspects of the Christian life allows Christ the brush strokes necessary to make of our very lives an icon to God’s glory – bringing depth and beauty to our existence and revealing, through us, God’s Glory to the world. Advent as a season of hope is a perfect time to deeply reflect on this transfigurative dimension of our Christian faith. This transfiguration has begun through our baptisms and it continues here and now. Two verses from St. Paul’s Second Letter to the Corinthians can aid us in reflecting on the transfigurative dimension of our lives in Christ. So, with unveiled faces, we all reflect the Glory of the Lord, while we are transformed into his likeness and experience his Glory more and more by the action of the Lord who is spirit.